Dec 20, 2017 › Categories: Featured, Got Beer? In the season in which family time reigns supreme, it’s a good idea to talk about the one thing that makes all of that time more bearable: wine. It can make the lamest of dad jokes a tad bit funnier, make your inappropriate uncle’s political views a bit more tolerable and numb the pain of getting a pair of knitted socks for the seventh year in a row. It’s also a great go-to for all of those secret Santa swaps and for all of the holiday parties you’ll inevitably RSVP to and need a host(ess) gift for. I’ve compiled a list of must-try and must-buy wines that will cover you on all fronts. First up we’ve got Jean-Paul Brun’s Domaine Terres Dorees Beaujolais Blanc. The Burgundian subregion of Beaujolais commands high praise for its food-friendly and all around approachable wines, but while it’s the Gamay-made reds that see most of the acclaim, it’s the delicious white wines that are the surprise stunners. Few people see the small percentage of white wines that come out of Beaujolais because, well frankly, there isn’t a whole lot of it. It’s basically the wine version of being the middle child; it’s loved and adored, but just doesn’t get the attention it deserves. The Terres Dorees is a Beaujolais Blanc composed of 100% older vine Chardonnay grapes and a whole lot of pizzazz. Rich in stone fruit flavors like peaches and nectarines, this wine is ideal for all of your holiday fare, including, but not limited to, the candy canes that you’ll probably still be eating deep into January. Some of the most raved about wines come from one of Beaujolais’ cru regions called Morgon. Romuald Petit is a relatively young vintner from France who is pumping out quality wines from his seven-hectare estate in Burgundy and his Chateau Gaillard offering is truly a quintessential holiday wine for half the price of what you’d expect to spend on a Morgon. Floral aromas of dried violets and roses waft up from the glass while deep notes of black cherry and blackberry provide a richness to the soft and silky bodied wine. If you’re in the market for impressing that special someone on your gift list, the Romuald Petit is for sure the way to go. Capturing magic in a bottle isn’t easy, but Kelley Fox does just that with her Mirabai Pinot Noir. Fox is a winemaker whose eccentric style mixes perfectly with the love and care she has for her wines. Hailing from the high pedigreed area of Willamette Valley, her Maresh Vineyard parcels yield pinot noirs that express a finesse and purity that can be tasted in each sip. Fox fully submerges herself into the winemaking process, sometimes even having total solitude from the outside world as she cares for her vines. Her style of winemaking is to let the natural beauty of each grape shine through and, in keeping with those ideals, she tracks moon phases and planet alignment in hopes of maintaining positive energy for harvesting her grapes. 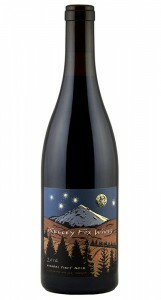 The Mirabai offering is a blend of pinot noir from two different vineyard sites, which helps keep this particular release as affordable as it is delicious. Abundant notes of ripe, red berries and tart blueberry marry up with warm spice notes and a hint of mossiness to create an opulent wine fit for any occasion. The Mirabai is a wine that’s vinified with a touch of mysticism and a bit of badass witchery, making it a great gift or talking piece for your holiday meal. Sparkling wines evoke a festive feeling in all of us and tend to be a fixture during milestones, celebrations and holiday soirées. Frederic Geschickt’s Obi Wine Keno Bulle is an Alsatian pet-nat made up entirely of Pinot Auxerrois which, although can be an unforgiving grape if not cared for properly, is oh-so-deliciously perfect in this exemplary effervescent wine. Bone dry and medium bodied, the Obi Wine is loaded with tropical fruit overtones and mouthwatering acidity. Its cloudy, golden hue and musky aroma are reminiscent of raw honey nectar. The contents of the bottle are so freakin good you almost forget about the fact that there’s a Star Wars pun going on with the name and label. You can be sure that the Obi Wine Keno Bulle will have you happy that the fizzy force is with you this holiday season.